Most NFL head coaches got their current positions by advancing through the NFL coaching ranks. For example, Bill Belichick, widely believed to be the best NFL coach, worked his way up from 11 different versions of an assistant NFL coach before becoming an NFL head coach. Every now and again, the NFL deems a college head coach worthy of going directly from his collegiate post to the same position in the NFL. In fact, aside from Belichick, there are only two other NFL head coaches who also have the powers of a general manager: Pete Carroll and Chip Kelly- two coaches who leapt right from coaching college to those exalted positions in the NFL. When might an NFL team make such a decision? How might a college football coach be assessed to make the determination that he is ready to jump right to the top coaching spot in the NFL? For our money, the single best metric for assessing that college head coach is his team’s margin of victory (MOV) against-the-spread (ATS). [To read all about MOV ATS and its efficacy as an assessment tool, please CLICK HERE.] To advance our position, this article examines three coaches who went right from the college ranks to head-coaching in the NFL: Pete Carroll, Chip Kelly, and Jim Harbaugh. While it is true that Pete Carroll was a head coach in the NFL before his glorious tenure at USC, by nearly all accounts, his four pre-USC years as an NFL head coach were considered a failure. In fact, for the 2000-2001 season, Pete Carroll did not have any coaching job anywhere. When he was hired by the University of Southern California a year later, he was (supposedly) USC’s fourth choice. 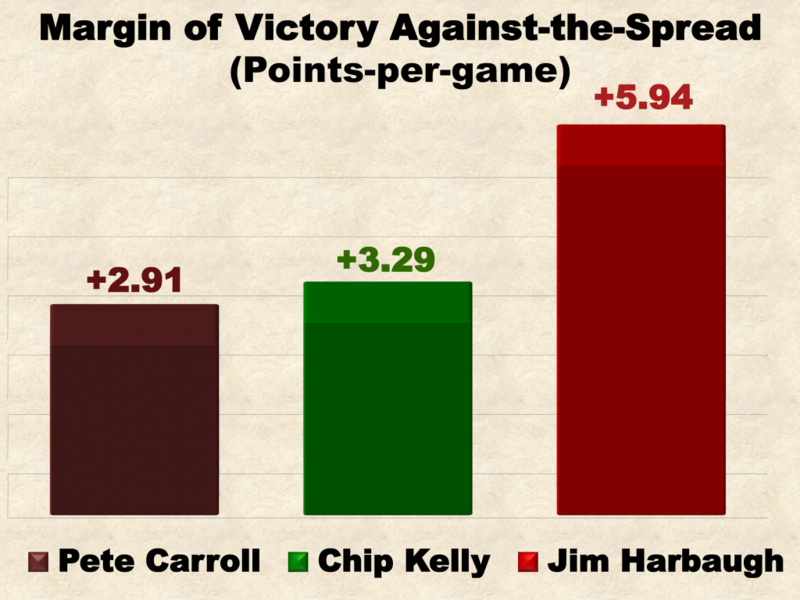 From the 2001 through the 2009 season, Pete Carroll built himself legendary status as USC’s head coach. Under Coach Carroll, USC had 25 first-team All-Americans, won three Heisman Trophies, and captured two national championships. Based on those accomplishments alone, Carroll could have been given whatever he wanted in the NFL- he was no hidden gem. Even so, using our favorite coaching assessment tool, Carroll’s MOV ATS at USC was +2.91. In other words, Pete Carroll’s Trojans exceeded the (lofty) public expectations by nearly a field goal per game. Unlike Carroll, Chip Kelly had absolutely no NFL coaching experience prior to being handed the keys to the Philadelphia Eagles. In fact, other than his four years as Oregon’s head coach, Kelly had no head-coaching experience at any level. Very much unlike Carroll, Oregon under Kelly had just three first-team All-Americans, no Heisman Trophy winners, and won no national championships. How would that head-coaching résumé merit an offer of NFL head coach and general manager? We believe, as the Philadelphia Eagles did, that the popular measures for success do not take context into consideration. What measure does account for context? The answer is MOV ATS. His MOV ATS was +3.29, and that meant that, for the average Oregon game coached by Chip Kelly, the Ducks exceeded public expectations by more than a field goal. Even though Jim Harbaugh chose to leave the NFL and return to the college ranks (via a very lucrative contract with his alma mater, Michigan), Harbaugh’s only NFL coaching experience was as a quarterbacks coach for the Oakland Raiders for two years. His first head-coaching gig anywhere was at the FCS school, the University of San Diego. That is not to be confused with San Diego State University (of the FBS). From there he was hired as Stanford’s head coach where, much like Kelly, he coached a grand total of three first-team All-Americans, no Heisman Trophy winners, and he won no national championships. He never won a Pac-10 Championship, and his win-loss record of 29-21 was good enough for the San Francisco 49ers to sign him to a five-year contract to be their head man. How does Harbaugh’s college résumé recommend him for such a storied position in the NFL? Again, just as the 49ers must have believed, popular measures for success do not take context into consideration. MOV ATS, of course, does. Harbaugh’s MOV ATS at Stanford was an amazing +5.94- exceeding public expectations by nearly two field goals per game! Hiring “search firms” or high-priced consultants to find their next NFL head coach could cost a team hundreds of thousands of dollars and still not necessarily lead to success. Our simple metric, MOV ATS, would cut through any hyperbole, identify overvalued and undervalued coaches, and do so simply and objectively.